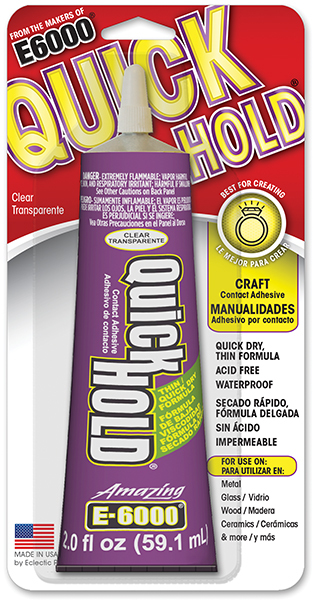 Quick Hold is a unique all-purpose craft contact adhesive and sealant with a thin consistency for precise applications. Its quick-dry formula allows crafters the quick set needed for many craft projects. Quick Hold becomes water resistant immediately upon application. It’s also paintable and clear. Thin formula: lays down thin adhesive bead for fine detail. Quick dry: perfect for all your craft needs. Sets in 2-3 minutes. Fully cured in 2-6 hours. Waterproof: use to decorate craft projects in and around water. Paintable: paintable for continuous color on craft projects.